A MESSAGE FROM SHASTA COUNTY – Shasta County Health and Human Services Agency Public Health Branch continues to investigate a confirmed case of measles. Public Health officials urge residents to be aware of measles symptoms and to take precautions to help stop the spread. If you were at the specific locations during the times in question you can call (530) 225-5591 to speak with Public Health staff. The Shasta College 800 Building on March 19 from 9:30 p.m. to noon and 3:30 to 5 p.m. The Raley’s Supermarket on Lake Boulevard in Redding on March 19 from 11 p.m. to 12:30 p.m. 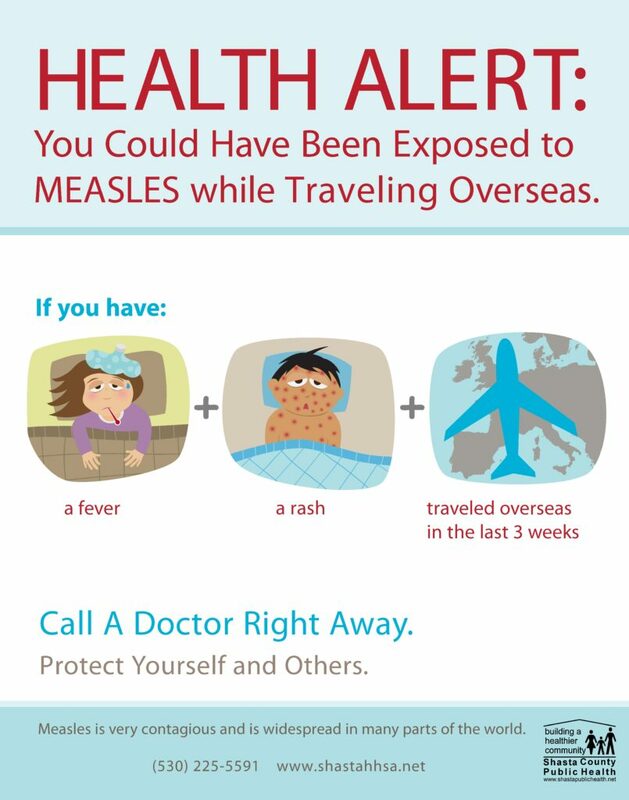 Please call a physician if you are displaying measles symptoms. DO NOT go out in public, to a clinic, hospital or physician’s office before calling their facility to prevent spreading the disease to others. An individual is infectious from four days before the rash starts through four days after the rash appears. For more information about measles and please visit www.shastahhsa.net and click on the “Information on Measles” banner at the top of the page.